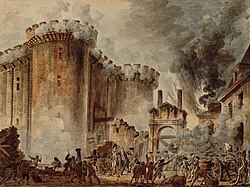 Tharla Fhorghabháil an Bastille (An Fhraincis: Prise de la Bastille [pʁiz də la bastij]) i bPáras, an Fhrainc, ar an tráthnóna of 14 Iúil 1789. Rinne an daingean meánaoiseach, armlann, agus príosún polaitiúil i bPáras atá aithne air mar an Bastille ionadaíocht údarás ríoga sa Pháras lárnach. Tugadh an leathanach seo cothrom le dáta an 14 Iúil 2017 ag 21:31.